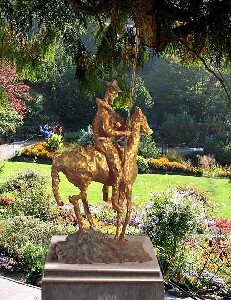 Description: This sculpture Is available in a limited BRONZE EDITION. Enlargement can be made to any size according to request. Ask for price by clicking on contact button below. Tamir Chaim was born in 1947 in Austria, where he emigrated from, with his parents to Israel. He has been involved in plastic art for the last thirty years. He studied classical drawing for five years under Josef Shwarzman(former teacher at the Berlin academy of art, who immigrated to Israel in 1993) and under Moshe Rozentalis for two years. He also studied in several schools and art courses in Israel. For 10 years he worked as graphic designer. His paintings were presented in several solo exhibitions in Israel. My art is an experience to express myself in an imaginative and visual language, which tries to combine old and new. I try to describe the substance and spirit of the figures through vibrate lines and rough textures. These lines also reflect in a certain sense the violence and tension of the present Israeli society. The sculptures that I design are figurative with a strong tendency toward the abstract. The subjects are traditional, but they are presented with innovative elements, which are taken from modern technology and new approaches to drawing and sculpture. Generally I make figures of men, women and animals, which look sometimes legendary. They are seen deformed, blunt and sometimes grotesque. The finishing degree is like a sketch and they are seen as 'unfinished'. I donA't like to be engaged in small details: the most important thing for me is to express a general conception and be able to explain the subject, the action and movement of the body. A part of my inspiration is taken from the old masters, and I try to combine subjects from the past, with an innovative approach.